The Durable Plus Series is an enhanced locker based on the Durable series build. Our recessed handle is part of every Durable series locker. This prevents protrusions from the locker front and accepts a built-in lock or padlock. The doors are solid 14 gauge with rubber bumpers on all latch hooks for quiet operation. The latch channel is silenced by nylon guides. This locker also comes with a 16 gauge continuous piano type riveted to both door and frame. Ventilation for this series is achieved by slots in the top and bottom flanges of the doors. This locker is ideal for situations where you might encounter tougher than normal usage. 2.3 Doors: Shall be 14 gauge, channel-shaped on both the lock and hinge side, with angle formations across the top and bottom. 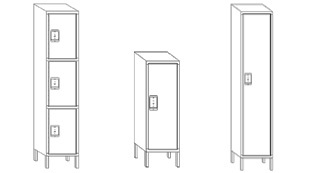 One, two and three tier lockers doors shall have 16 gauge full height reinforcement channel. 2.5 Latching: On single, double, triple, and two-person lockers the lifting trigger will be 14 gauge steel, attached to the latching channel. The trigger will have a padlock eye for use with 9/32” diameter padlock shackle.